The East River isn’t really a river at all, but a tidal strait between Manhattan and Long Island that, because of tides, appears to flow like one. New York Presbyterian Hospital soars like a great, white sail over the East River. This great, granite sheet spans several blocks of Midtown East, swallowing the FDR highway whole. Looking southeast, the river below races just below, fast past Roosevelt Island and the Queensboro Bridge beyond. From inside, it’s as if one is floating above the city itself, rolling along in the waves, to and fro with the tide. We nudged at the uncertainty, gingerly wondering aloud why our baby was in the five percent of babies who don’t turn in preparation for labor. “The baby’s resting its head near your heart,” I said. “There’s no better, more-peaceful place to be.” Quietly, though, I worried, pushing aside the terrifying possibility that something was wrong. By the time we signed into New York Presbyterian’s seventh floor labor and delivery ward at precisely noon on Monday, then, we’d made an unsteady peace with it all. We spent over nearly hours talking nervously in the crowded waiting room. I snuck away to the hospital chapel just long enough to eek out a brief prayer, a highly-inarticulate invocation consisting mostly of “please, please, please.” When I returned to the waiting room, Abbi had been admitted. The OR was flooded with cold, fluorescent light. Doctors and nurses were already bustling about. Abbi was on her back, draped in a blue gown with a curtain over her chest and oxygen in her nose. I kissed her on the forehead, stared into her eyes, and began distracting her with remembrances of our first trip together to Honduras. “Keep talking,” she said as our story approached our first, long walk on the beach. Abbi and I looked at each other in disbelief. For months, every street corner prognosticator from Puerta Plata to Paoli, Pennsylvania, had diagnosed her low-carry as an imminent sign that we were having a boy. “It’s a girl!” Dr. Waterstone repeated. They weighed her, swaddled her, and handed her to me. “Introduce her to her mommy!” Wendy said. I tiptoed to Abbi, and placed our daughter’s cheek at her mother’s lips. Like so many evenings prior, I sang “Golden Slumbers” to sooth her, and she settled quietly into my arms. We smiled through tears in a room so white, so bright, it may well have been Heaven. For the next few hours, we eschewed the usual battery of medical industrial procedures, and kept our precious, little bundle as close as possible. I held her to my chest as Abbi’s surgery was completed, then handed her over to her mother who immediately began nursing. Our daughter was wide-eyed and alert, her eyes scanning our awe-struck faces. Family came and went, and we were ushered to our room. We struggled through the night to feed, swaddle and sooth our little Maggie, every passing moment filled with new wonder, awe, anxiety and exhaustion. We watched her tiny lips purse, her perfect brow furrow. We watched her tiny eyelids squint into the light, her dark pupils scanning her new world. And we looked at each other and laughed through tears, more awake, more alive, and more in love than ever before. As morning broke, we sat by the window with our little wonder watching the sky turn from dawn to day. Maggie yawned and stretched and struggled against the new day, finally collapsing, exhausted, into her mother’s arms. Past the flowers in the window, seven stories below our granite sailboat, the East River was changing course. The water frothed, rumbled and boiled, then turned and headed out to sea held sway by the moon and lit by the sunshine of a brand-new life. Beautiful…all of it…your post, the day(s), your wife, your daughter – your family! Congrats again, my friend! Thanks so much for sharing her birth story with us Benjamin, she’s a beautiful little baby and she’s so lucky to have you two as her parents. The other day I was in the home stretch of my run which had me moving up a steep hill through a field that in summer is so beautiful it can make you cry and suddenly I thought of you and how perfectly right it felt that your first child was a daughter. I can’t wait to hear the songs you’re going to write for Maggie. Abbi looks like she has everything she ever wanted in life in your little video. Between the loving looks at you and then back down at Maggie and the tenderness in the way she’s holding and swaying gently with her … it’s like a kind of music of it’s own. Congrats! Let your new life begin. From now on, nothing is the same. 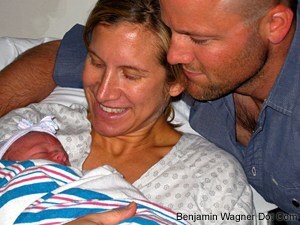 Welcome to Parenthood and welcome to Maggie! Congratulations! Your little Maggie is beautiful! Ben! Your blog entry about Maggie just brought tears to my eyes. Your description of Maggie’s birth was just breathtaking. Although I haven’t seen you in almost 6 years (I still consider you the 9th Slavin/Perreault cousin!) I couldn’t be more happier for you, Abbi, Maggie, and your brilliant looking new film. Congratulations on the NFF and your beautiful growing family. I’m a firm believer of “what goes around comes around”; and it’s your good soul that’s bringing you all of these miracles.